What You Can Learn From Sara Bareilles Leadership Song - I believe that everyone in the world is familiar with singer and song writer named Sara Bareilles. She is one of notable singers in the world nowadays. One of her songs which been being at the top chart until several months in the world. This song is known as a masterpiece and healing chore toward people soul. I bet you already know about “Brave” from Sara Bareilles. The song is really inspiring and touching for most people. By writing and singing “Brave”, Sara Bareilles gained some accomplishments and made an outbreak to the world of music. The song is written from her daily observation about people who give up their life instead of continue fighting. Based on the fact, here is what you can learn from “Brave” song, the leadership song from Sara Bareilles. The first thing you will learn from “Brave” is we can be amazing and capable to turn fear into weapon to face a lot of problem. We also can be the outcast, standing at the top of the world and be a leader. It is not impossible if we keep trying every day. There is no “late” in trying and fighting. Every under pressure accident could be resolved as long as we keep thinking. I am sure that the song is made for people who have fear under their skin. Yet, this song is building courage in stage every time we listen to it. I, myself, love this song since I heard it to the radio. “Brave” is teaching me about how to be a great leader and a leader described has the capability of being strong, initiative, firm, patient, and brave itself. 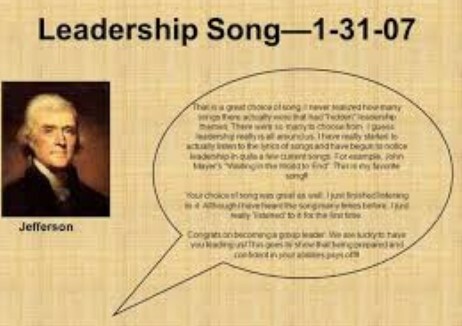 This leadership song is truly a legend until this day. Now, I often hear this song aired in many events and championship. This fact I could not deny because “Brave” always make me stronger when I face many problems and accident in my daily activity. This is the best leadership song so far.